Anglers of today know nothing about the joys of fishers. They don't catch fish, only tiddlers. Who says that? 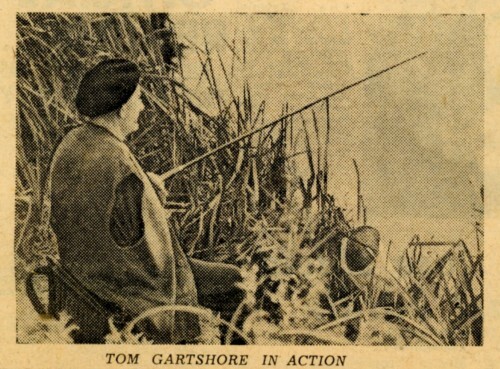 Tom Gartshore, oldest active member of the Old Quornian Angling Society. Now 66, he's been fishing the Soar for 58 years. His opinion is not one to be ignored. Says he: "Fishing! today's anglers - they catch too many sprats." And he says it with a reminiscent toss of his head, which compels a vigorous nod of assent. His eyes sparkle as he flips a tiddler back into the waters. "Them isn't fish." he confides. 'But them are the sort today's anglers count in match fishes." The tiddler wasn't even three inches long. Continues Tom, who lives at The Cot. Spinney Drive. Quorn: "When I was in my prime they wouldn't count any fish that was less than six inches long: not in championships!" Mind you, Tom isn't one of those who is adamant that the present generation can't do anything at all as good as those of generations gone by. He is willing to attribute the present wave of "tiddlers" to two things. First, he says, after the great poisoning of the river 38 years ago it was never properly restocked. The real big fish were never replaced. Secondly, he blames the use of maggots as bait. "The bigger fish take their time in rising to a bait. Little fish love them and beat them to it. But they leave worms alone and so let the big fish get a look in." Compared with what? Perhaps this for instance: Two decades ago, when Tom was a member of the Quorn Piscatoriels, they had a match with Hickling and Hoes. And some match it was! It lasted a whole day and night. Sometime during the long day Tom was engrossed in his float when, subconsciously scenting that something was wrong, he looked up. Row upon row of unattended rods protruded from the bank as far as the eye could see - but no anglers. None at all. When Tom went to investigate he found them in a field some hundred yards away: playing cricket. "Wouldn't happen today." he grins - a wicked grin, too Modern fishing. Up to 12 years ago Tom used to sweep the board at most Old Quornian contests. Now he is retired he spends part of every day with his rod on the banks of the Soar. In addition he is an expert shot - all very remarkable if you remember he lost an arm as a result of an accident in a Loughborough brickyard as long ago as 1906. His parting shot: “Find a modern angler who can catch an average of 40 perch of 2lbs. each every day. I did it in the old days." Fishing ain't what she used to was, that's certain.